Prof. Irwin Cotler, EJC Director of Legal and Public Affairs Ariella Woitchik, Lea Goldin, Simha Goldin, Tzur Goldin. 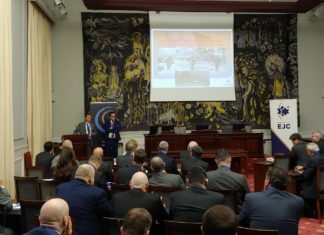 The European Jewish Congress attended a joint event organised by the four major political groups on the humanitarian case of Lt. Hadar Goldin. Lt. Hadar Goldin of the Givati Brigade was kidnapped and murdered by Hamas on August 1, 2014, during Operation Protective Edge, two hours after the terrorist organisation had agreed to a UN-mandated humanitarian cease-fire. Hamas continues to hold his body today, presumably as a bargaining chip to extract political or military concessions in future conflicts with Israel. The family of Lt. Goldin spoke emotionally about the grief caused by Hamas’ conduct, which consciously and perfidiously denies the swift burial of Lt. Goldin, as required by Jewish tradition. “For four years my family has been constantly intimidated and terrorised by Hamas in order to make us pressure our government to release thousands of convicted murderers from Israeli jails. Hamas is desecrating the body of my brother, abuses and as a political tool and as a means for propaganda.” said Tzur Goldin, Sgt. Goldin’s twin brother. Lea Goldin, Hadar and Tzur’s mother added: “My husband Simha and I are here today not to convey a political message. 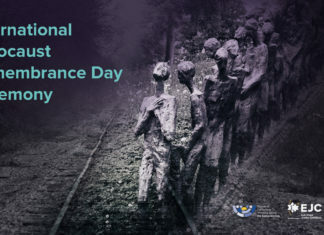 We are here to ask you to be on the right side of history; to enforce humanitarianism on those who deny and ignore it; to come up and say that all are God’s children and therefore all should find peace – if not in life then in death”. 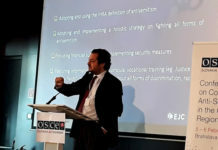 They were joined by Prof. Irwin Cotler, Former Minister of Justice and Attorney General of Canada, an international law expert, who spoke in detail about the severe and systematic violations of international humanitarian law and who gave concrete recommendations for the EU to take in this case. The MEPs present at the meeting welcomed these suggestions and asked Prof. Cotler to submit these to the European Parliament in writing. 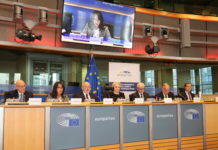 The event was co-hosted by MEP Bastiaan Belder (ECR/Netherlands), MEP Péter Niedermüller (S&D/Hungary), MEP Cristian Dan Preda (EPP/Romania), MEP Frédérique Ries (ALDE/Belgium) and MEP Anders Primdahl Vistisen (ECR/Denmark). 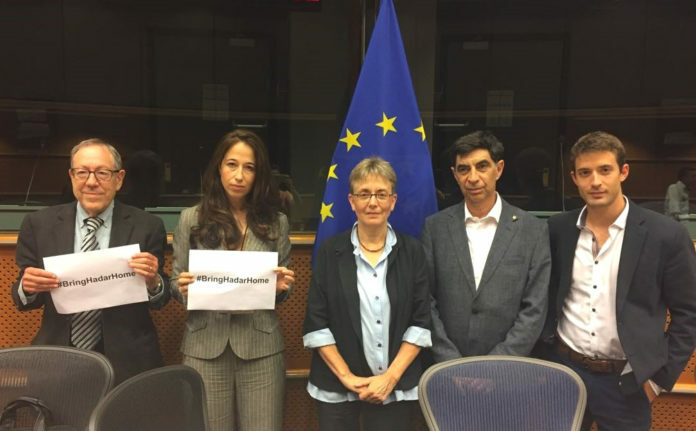 During the event, MEPs brought forward a petition calling on Hamas to return the remains of Lt. Goldin and Sgt. Oron Shaul and to release Israeli citizens Avera Mengistu and Hisham Al-Sayed, who are currently being held captive in Gaza.